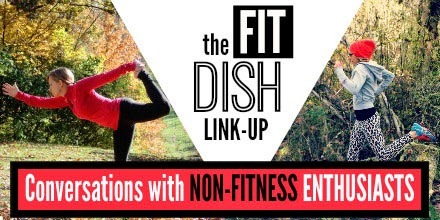 This is my first time linking up for #TheFitDish with Jill Conyers and Jessica Joy. I couldn't resist this week's topic. We've all had them right?! Conversations when you mention an upcoming race, or a fitness accomplishment you've achieved, and you're met with a blank stare or a ridiculous response. Me: I think I'm going to start biking into work again. Co-Worker: Does that mean you won't have to...I mean...get to...I mean...will you not run as much? Me, laughing: No, it just means I'll do both! Me: I'm running a 5k this weekend! Co-Worker: Are you going to win? Co-Worker: How was your marathon last weekend? Me: Marathon? Oh, you mean the 5k. It was really awesome! I ran my fastest one ever. Me: Uh. Not anywhere near that fast. Thanks for making me feel bad about my PR. lol. These are 3 real life conversations that I had in the past few weeks with 3 separate co-workers. After each of them, I could only shake my head and laugh. They just don't it get. And normally, I really don't mind. Normally, I just laugh it off. But every once in a while, it's annoying. Every once in awhile, I wish everyone would just know what it means to run a marathon or get a Personal Record. And share in my triumphs! What's the most ridiculous conversation you've had about fitness or running with a non-fitness enthusiast? Has your enthusiasm inspired someone to join the fun? Your conversation with your coworker made me laugh! The funniest thing that I've heard regarding a race was "um why would you do that?" to which I reply "why wouldn't you?!" I love this response, too! Everyone should run races!! Love that you shared actual convo's! Luckily I work in a "wellness department" so we all go for walks during lunch or workout after work, etc. but some of our other coworkers think we are crazy. They're always like.. umm, how do you shower if you walk during lunch? I never get too sweaty so wet wipes work quite well... probably TMI, but then they know there are options! Clarinda, I am ecstatic that you are joining us for the first time, and I love your fun attitude! I work at a gym, and live in Eugene with a big running culture, so luckily my non-fittie conversations are rare. But, typically, people think I am judging unhealthy choices, so I have learned to not talk about fitness so much, so they can let their guard down : ) But, I understand wanting people to know certain terms, so they can understand your victories. Well, I do, and you're awesome! Keep up the amazingness beautiful lady! Thanks so much, Jessica! I'm glad I remembered the link up. :-) I still make a lot of unhealthy choices, so I don't think people think I'm too judgy, but maybe more than I know?! Thanks, Farrah! Sometimes all we can do is laugh. It's make life more fun, anyway! !